The mouth is a window into the health of the body. Maintaining good oral health means being free from pain in the oral and facial region; absence of oral sores and lesions; free from periodontal diseases, dental caries, tooth loss, and many other diseases and disorders that affect oral cavity. Oral health is considered as an important component of public health, and oral diseases are among the preventable noncommunicable diseases. India is the second highest populated country with more than two billion population, out of which approximately 72% live in rural areas and 28% live in urban areas., The dentist to population ratio is 1:10,000 in urban areas and 1:250,000 in rural areas. Evidence has shown that there exist disparities in oral health status of urban and rural populations., Majority of the epidemiological studies in India that have been published are focused on school children,, and studies done on people living in rural areas covering all indexed age groups appear to be fewer and limited, which is essential for oral health service for the population. In a study on rural women, prevalence of dental caries was 60.2% and it was found that age is the most associated risk factor for caries. The caries prevalence rates among 30–35 years aged population in West Bengal, Orissa, and Sikkim were 18.1, 24.5, and 20.1%, respectively. A study in rural Moradabad showed 91.2% prevalence of periodontal diseases among 40–49 years age group. The World Health Organization (WHO) recommends basic oral health surveys in five selected age groups (i.e., 5 years, 12 years, 15 years, 35–44 years, and 65–74 years) to estimate the magnitude of the problem and to plan intervention activities. Thus, in the light of above situation, this study was conducted with an aim to assess the prevalence of oral diseases and treatment needs among 5 years, 12 years, 35–44 years, and 65–74 years age group population residing in rural areas of Nellore district, India. Nellore is a land of rice fields located in Southern India and covers an area of 13,076 km 2. In 2011, the population was 2,963,557 people with a decadal growth rate of 11.15%. Majority of the population live in rural areas (70.9%) and engage in farming. This cross-sectional survey was carried out in rural areas of Nellore district, and the survey method was by multistage cluster sampling methodology. Nellore district is divided into five divisions with headquarters at Nellore, Gudur, Kavali, Naidupet, and Atmakur. The five divisions of Nellore district are divided into total of 46 mandals; two mandals are randomly selected from each revenue division and one village is randomly selected from each mandal. Thus, ten sampling sites were chosen for this study. After ethical approval from the Institutional Ethical Board, examiners were calibrated in the Department of Public Health Dentistry before the pilot study. A pilot study was carried out on 100 subjects in a village of Nellore district to determine the feasibility of the methodology planned. Sample size was estimated at 680 and is rounded to 800 based on the recent population census of rural areas of Nellore district, with an allowable error at 1% and a confidence interval of 95%. Random samples of people of the WHO standard ages were selected based on the recent population census. The final sample included 4 age groups: 5 years (n = 201), 12 years (n = 200), 35–44 years (n = 207), and 65–74 years (n = 192). A door-to-door survey was conducted in August 2014 and September 2014 covering a population of 2,103,773 inhabitants, and households were selected by simple random sampling method in each village. A maximum of 20–25 subjects were examined each day. Informed oral consent was obtained from the village leaders and heads of the households before carrying out the survey. The adequate numbers of instrument sets were carried to the survey and proper sterilization and infection control measures were taken. Data collection was done using a structured pro forma consisting of questionnaire and clinical examination. The questionnaire consisted of demographic details, socioeconomic status, and oral hygiene practices. A single examiner, the investigator, clinically examined all the participants. All the subjects were examined under adequate illumination (Type III) using plane mouth mirror, curved sharp sickle explorer (standard explorer), and WHO probe. Oral hygiene status was assessed using simplified oral hygiene index (OHI-S). Dentition status and treatment needs, enamel opacities, oral mucosal lesions, community periodontal index (CPI), and dentofacial anomalies in children of 5 and 12 years, adults of 35–44 years and 65–74 years age groups were assessed based on modified WHO pro forma 1997. Means of decayed, missing, filled teeth (DMFT) and their components along with oral hygiene scores in each age group are calculated, and Chi-square test was used to analyze the data. Prevalence of periodontal disease among study participants was assessed by the highest CPI score in each age group. Linear regression analysis was executed to determine the association of independent variables with caries and periodontal statuses. Comparison between multiple groups was performed using Kruskal–Wallis test. Data were entered and analyzed using a software program IBM SPSS Statistics version 22 (Armonk, NY:IBM Corp) (P< 0.001). In a total sample of 800 participants, sample comprises 50.5% males and 49.5% females. Majority of the participants clean their teeth once daily (796 [99.5%]); among them, majority of subjects use toothbrush, 718 (89.8%) and fluoridated dentifrice, 702 (87.8%) and 412 (51.5%) participants rinse their mouth more frequently. Majority of the study population come under Class III and Class IV socioeconomic status, 52.8% (422) [Table 1]. In 12 years age group, 69.2% of subjects showed fair oral hygiene and 30.8% showed good oral hygiene status. Among 35–44 years and 65–74 years old age groups population, 54.1% and 42.2% showed poor oral hygiene status. Excluded sextants are 47.9% in older population. Dmft score in 5 years age group is 39.3%, 12 years age group is 53%, and 35–44 years age group is 77.3%. Among 35–44 years old age group, subjects decayed component contribute 64.7% of DMFT. In 65–74 years old age group, the total DMFT score is 81.8% and most of it is contributed by missing component which is about 77.1%. Among oral mucosal lesions, 4.5% of 5 years age group, 4% of 12 years age group, and 4% of 35–44 years age group subjects showed ulcerations. Among 35–44 years and 65–74 years old subjects, 4.5% and 9.9% showed abscess. Among 12 years old study population, definite malocclusion was seen in 18% and severe malocclusion was seen in 13.5% [Table 2]. The difference in mean component score (OHI-S) and cumulative scores between various groups was highly significant (P< 0.001). In mean caries experience, the D-component contributed most to the DMFT index which was also seen similar in children, young adults, and whereas in older people, M-component contributed to the most. Comparison between multiple groups was done using Kruskal–Wallis tests [Table 3]. Chi-square revealed significant differences in all the four periodontal parameters between the various age groups (P< 0.001). Bleeding on probing was more in 12 years age group population (69.0%). Adult population of 35–44 age group population had more calculus (54.6%) and shallow pockets (40.6%), whereas older population had more of excluded sextants (39.1%), deep pockets (6.2%), and shallow pockets (46.9%). All the values were statistically significant (P< 0.001) [Table 4]. Need for one surface filling in 12 years old is 45% and in 35–44 years old is about 48.8%, whereas need for two surface fillings is more for 5 years which is about 22.9%. Need for pulp care therapy in 12 years old people is 16.5% and 35–44 years is 23.2%, and majority of the older age group subjects need extractions which are about 52.1%. Other care (oral prophylaxis) is required in 83.1% of the 35–44 years old population [Table 5]. 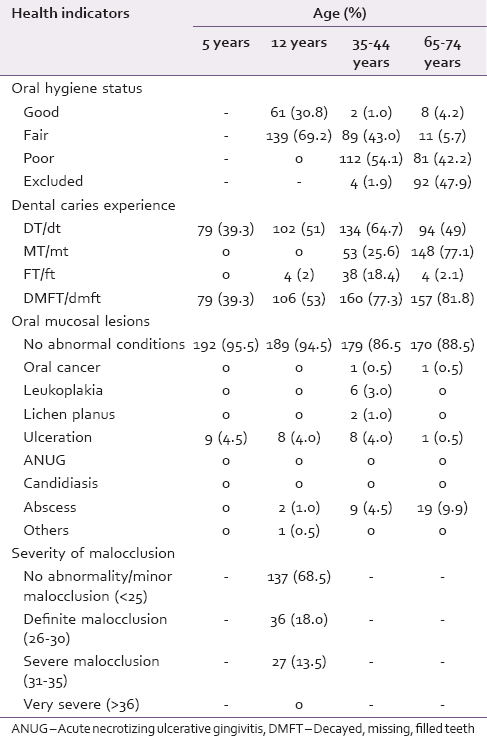 [Table 6] shows the results of stepwise multiple linear regression analysis of the caries status in relation to several independent variables, which include age, material used for cleaning, and rinsing habit practices. It is evident that all the variables in the model explained 49.1% of the variance in the caries status. The most significant contributor was age (39.9%), P < 0.0001. The contribution of substance used for cleaning and rinsing habit was small but significant (P< 0.0001). Logistic regression analysis was employed to determine the contribution of age, rinsing habit, use of fluoride toothpaste, and substance used for cleaning to periodontal status [Table 7]. All independent variables were statistically significantly related to periodontal status, except material used to clean teeth. The association between age of the subjects and their periodontal status was evident with an odds ratio (OR) of 36.09 times in the elderly age group. Subjects who rinse their mouth were less likely to have periodontal disease than those who never or sometimes with an OR of 0.08. Subjects using nonfluoridated toothpaste are more likely to have periodontal disease of 3.05 times than subjects using fluoridated toothpaste. Till date, there are no published data on prevalence of oral diseases of Nellore rural population. Overall in this study, 52.8% of subjects belong to lower income group which was similar to the study done in rural population of Moradabad, India, in which 54.9% of people were from poor families. In all age groups, around 89.8% of this study population used toothbrush and toothpaste for cleaning their teeth which is higher than the data compared with overall respondent in the National Oral Health Survey and Fluoride Mapping 2002–2003 (46.37% and 51.9%) and previous studies., In our study, mouth rinsing (51.5%) was the most adopted other oral hygiene aid by many people which is similar to the data of the National Oral Health Survey and Fluoride Mapping 2002–2003 and other study conducted in 2013. In our study, oral hygiene status of 69.2% of 12 years children amounted to be fair and was considerably higher compared to the data with previous study (2005) which was about 51.3%. Mean values of the OHI of all age groups and its components were high, which suggest a widespread and almost uniform neglect of tooth cleaning, which became more pronounced with age. In our study, the mean OHI-S score of 35–44 years age was about 3.50 which is in accordance with the previous study conducted in rural population of Ambala district, Haryana. Although majority of the study population using toothbrush and toothpaste to clean their teeth, their oral hygiene status was not good which suggest that they do not follow proper brushing technique. In our study, prevalence of malocclusion in 12 years old population was about 31.5% (definite and severe) which is in accordance to prevalence (30.84%) reported in the previous study  and in contrary to prevalence (8.46%) reported by another study  and is higher than the prevalence found in the National Oral Health Survey and Fluoride Mapping 2002–2003. The prevalence of oral mucosal lesions in 35–44 years study population, ulcers (4.0%), and leukoplakia (3%) was comparable with previous study conducted in rural areas of Ambala district  and slightly higher to the data reported in the National Oral Health Survey and Fluoride Mapping 2002–2003. In this study, prevalence of dental caries in 5 years and 12 years old population was 39.3% and 53% which was higher than the findings of the previous study  and was similar to the findings of the National Oral Health Survey and Fluoride Mapping 2002–2003. The prevalence of dental caries in 35–44 years old study population was 77.3% which was similar to a previous study  and with the National Oral Health Survey and Fluoride Mapping 2002–2003 (79.6%). In this study, the mean number of decayed teeth decreased with increase in age from adults to older (mean 2.06–1.59), whereas the mean number of missing teeth increased with age (mean 0.85–11.79); similar findings were reported in a previous study. This indicates that decayed teeth in the older people are generally extracted and missing component comprises most of the DMFT score. The results of stepwise multiple linear regression analysis of the caries status in relation to several independent variables showed evidence that the most significant contributor for DMFT was age which was explained with a variance of 39.9%. The overall prevalence of score 1 (bleeding) of CPI in 12 years old study population was 69% which was higher than the report of the National Oral Health Survey and Fluoride Mapping 2002–2003 rural population (26.3%). The overall prevalence of score 2 (calculus) and score 3 (shallow pockets) of this study in 35–44 years was 54.6% and 40.6% which was similar to previous study  and slightly lower than the scores reported by the National Oral Health Survey and Fluoride Mapping 2002–2003 (52.0% and 20.0%). This survey reported high levels of gingival bleeding and calculus and low scores of advanced periodontal symptoms. These conditions are preventable, primarily through proper oral hygiene practices. The periodontal conditions tended to be relatively poor among people living in rural areas, and this study demonstrated the same and this might be because of irregular oral hygiene practices. These findings on periodontal status correspond to the results of the previous study. The overall prevalence of periodontal disease was high among 65–74 years age group and 35–44 years age group subjects in this study which is similar to a previous study. In this study, periodontal status and oral hygiene status deteriorated with age and tooth loss increased with age. Previous study  suggests that age, gender, education, and oral hygiene status as risk factors for periodontal disease. In this study, the rural population exhibits low education, poor oral hygiene, and placing them in a high-risk group for periodontal disease. The results of logistic regression analysis with CPI as dependent variable showed that the association between age of the subjects and their periodontal status was evident with OR of 36.09 in the elderly age group placing them in high-risk group. In a previous study, it was found that there is an association between age of the subjects and their periodontal status with OR of 2.3 times more in older age group. Overall, this survey has provided a valid overview of the oral disease status at the population level. Having found significant relationships between caries status, periodontal status, and several independent variables, perhaps, future programs can be developed in rural India to improve oral health practices which in turn may bring about an improvement in oral health status. In addition, we recommend including oral health component in the National Health Policy 2015 to reduce oral health problems in later years. The strength of this study was that it included four WHO-recommended index age groups and followed multistage cluster sampling methodology. Although several studies have reported on the oral health status and treatment needs of school children in India, there is scarce literature on rural population including all WHO index age groups. Hence, further research is needed to investigate the oral health of the various rural populations which should include large sample size. Rural population is characterized by high prevalence of periodontal diseases, dental caries, poor oral hygiene, high treatment needs, and lack of dental care. Higher age was a significant nonmodifiable risk factor for dental caries and periodontal diseases. Under these circumstances, there is a great need to educate and motivate population toward oral health and also to increase awareness about available facilities and the implementation of a basic oral health care program for the population and inclusion of oral health component in national oral health policy. We convey our sincere thanks to Dr. Vinayak for his help in statistical analysis. Available from: http://www.who.int/mediacentre/factsheets/fs318/en/index.html. [Last accessed on 2015 Oct 24]. Chandramouli C. Census of India. Rural Urban Distribution of Population, Provisional Population Total. New Delhi: Office of the Registrar General and Census Commissioner, India; 2011. Ahuja NK, Parmar R. Demographics and current scenario with respect to dentist, dental institutions and dental practices in India. Indian J Dent Sci 2011;2:8-11. Varenne B, Petersen PE, Ouattara S. Oral health status of children and adults in urban and rural areas of Burkina Faso, Africa. Int Dent J 2004;54:83-9. Singh GP, Bindra J, Soni RK, Sood M. Prevalence of periodontal diseases in urban & rural areas of Ludhiana. Indian J Community Med 2005;30:128-9. Rao CN, Metha A. Dentition status and treatment needs of 12 year old rural school children of Panchkula district, Haryana, India. J Indian Dent Assoc 2010;4:303-5. Arora G, Bhateja S. Prevalence of dental caries, periodontitis, and oral hygiene status among 12-year-old schoolchildren having normal occlusion and malocclusion in Mathura city: A comparative epidemiological study. Indian J Dent Res 2015;26:48-52. Jagadeesan M, Rotti SB, Danabalan M. Oral health status and risk factors for dental and periodontal diseases among rural women in Pondicherry. Indian J Community Med 2000;15:31-8. Mandal KP, Tewari AB, Chawla HS, Gauba KD. Prevalence and severity of dental caries and treatment needs among population in the Eastern states of India. J Indian Soc Pedod Prev Dent 2001;19:85-91. Batra M, Tangade P, Gupta D. Assessment of periodontal health among the rural population of Moradabad, India. J Indian Assoc Public Health Dent 2014;12:28-32. World Health Organization. Oral Health Surveys – Basic Methods. 4th ed. Geneva: WHO; 1997. Dudala SR, Arlappa N. An updated Prasad's socio economic status classification for 2013. Int J Res Dev Health 2013;1:26-8. Bali RK, Mathur VB, Talwar PP, Chanana HB. National oral health survey and fluoride mapping. New Delhi: Dental Council of India; 2002-03. Singh SV, Akbar Z, Tripathi A, Chandra S, Tripathi A. 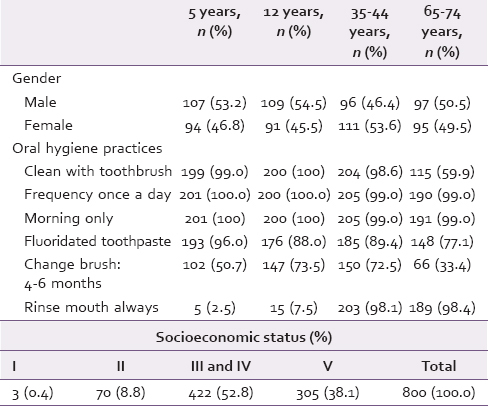 Dental myths, oral hygiene methods and nicotine habits in an ageing rural population: An Indian study. Indian J Dent Res 2013;24:242-4. Mahesh Kumar P, Joseph T, Varma RB, Jayanthi M. Oral health status of 5 years and 12 years school going children in Chennai city – An epidemiological study. J Indian Soc Pedod Prev Dent 2005;23:17-22. Kumar A, Virdi M, Veeresha K, Bansal V. Oral health status & treatment needs of rural population of Ambala, Haryana, India. Internet J Epidemiol 2009;8:22-7. Singh M, Saini A, Saimbi CS, Bajpai AK. Prevalence of dental diseases in 5- to 14-year-old school children in rural areas of the Barabanki district, Uttar Pradesh, India. Indian J Dent Res 2011;22:396-9. Das UM, Beena JP, Azher U. Oral health status of 6-and 12-year-old school going children in Bangalore city: An epidemiological study. J Indian Soc Pedod Prev Dent 2009;27:6-8. Rao NV, Suresh S, Ahmed Z, Pratap KV. Dentition status and treatment needs of 5 and 12 year old school children in urban and rural areas of Guntur, India. J Oral Health Community Dent 2012;6:126-30. Shah N, Sundaram KR. Impact of socio-demographic variables, oral hygiene practices, oral habits and diet on dental caries experience of Indian elderly: A community-based study. Gerodontology 2004;21:43-50. Kamath DG, Varma BR, Kamath SG, Kudpi RS. Comparision of periodontal status of urban and rural population in Dakshina Kannada district, Karnataka state. J Oral Health Community Dent 2010;4:34-7. Torrungruang K, Tamsailom S, Rojanasomsith K, Sutdhibhisal S, Nisapakultorn K, Vanichjakvong O, et al. Risk indicators of periodontal disease in older Thai adults. J Periodontol 2005;76:558-65.